The poor coverage on the West coast had been highlighted by a near tragedy in 1926 when two Aranmen, who had been marooned on a tiny island at the Eastern end of Árainn, were only rescued with the help of two British trawlers, a retired army officer and the efforts of three local men who volunteered to go ashore in a small boat. We have covered that story in a previous blog. Also in 1926, two Welsh trawlers had sunk off the west coast with the loss of nine men. The dramatic accounts of the survivors made world headlines and helped focus attention on the huge gap in R.N.L.I. coverage on the west coast. 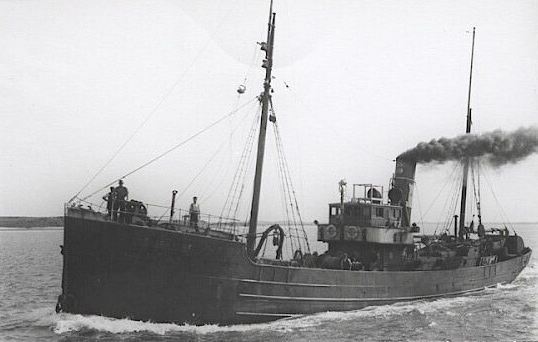 At 5 A.M on the morning of February 14th 1926, the Swansea Steam Trawler, Tenby Castle struck a rock or submerged flotsam somewhere off the island of Inishturk. They sent out a distress call which was picked up by other trawlers and by Valencia radio station. Valencia attempted to get a boat from Fenit to assist but another Welsh trawler, the S.T. Cardigan Castle was already proceeding at full steam to the rescue. Built in 1928 to replace the boat lost in 1926. Last of three Tenby Castle trawlers. The fact that there was no lifeboat stationed anywhere near enough to help was a huge disadvantage as trawlers are not as well designed as lifeboats when it comes to saving lives. While attempting to launch the Tenby Castle lifeboat, the rope snapped in the swell and only for the bravery of one of the crew, fireman Leonard Cloudsdale, who swam after the drifting lifeboat, all would surely have been lost.The rest of the crew threw him a rope and although it became entangled around his neck, he bravely hung on and all managed to board her. The night was stormy and pitch black but at about 9 A.M. they spotted a currach through the fog and were taken in tow by two Inishturk currach men who showed great strength, oarsmanship and courage in towing them over a mile to the island. Here they were treated with great care by the islanders and all twelve crew of the Tenby Castle were to survive. The crew of the Cardigan Castle were not so fortunate. 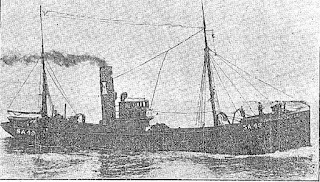 At about 7 P.M. on February 14th, while proceeding at full speed they struck a rock near the mouth of Clifden Bay and they too had to send out an S.O.S.The lights failed soon after and the crew had little time to act as she began to sink . Just as the other boat had difficulty launching their lifeboat, the Cardigan Castle crew also saw their lifeboat drifting away after a painter line snapped. One member of crew, twenty six year old Henry Batchelor, asked if anybody was prepared to join him in attempting to swim to the lifeboat. Getting no volunteers, he dived into the sea and proceeded to swim for the drifting boat. On his way he came across Captain Fall's little black Pom, "Fally", who had been washed off the stern and the two of them made it as far as the half submerged lifeboat and safely. In the foggy darkness of a stormy sea and with only a shovel for paddling, he lost sight of the trawler and drifted in the lifeboat for many long hours. Because both Inishturk and Clare Island were completely cut off from the mainland, the fear was that both crews, comprising twenty two men, had been lost and the massive search and rescue attempt continued. For four days, newspapers around the world carried headlines about the almost hopeless search and once again the absence of a lifeboat on the West coast was commented on. When two bodies were washed ashore near Roonagh pier, Clew Bay on the evening of the 17th February, they were identified as George Russell and Ned Lewis from the Cardigan Castle. Ned's father was the Chief Engineer on the Cardigan Castle and was also drowned. Commander Vaux of the R.N.L.I. hired a boat in Clifden and along with local volunteers and Supt. McQuillan of the Coast Guard, searched many of the smaller islands off the coast. 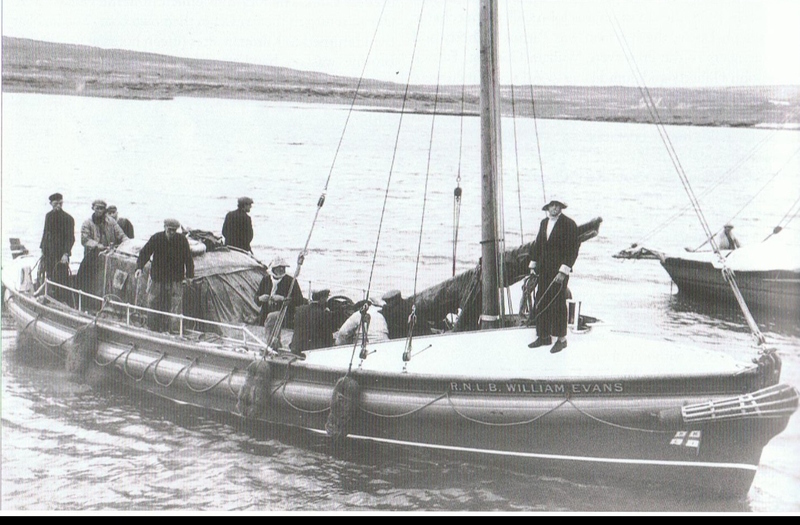 There had been a belief that some of the men were marooned on High Island but after landing there, the searchers found nothing.The local Garda Seargent Tobin in Clifden accompanied by two volunteers, John King and John Sweeney took a huge risk in landing on Friar's Island off Omey, in an effort to find the men. 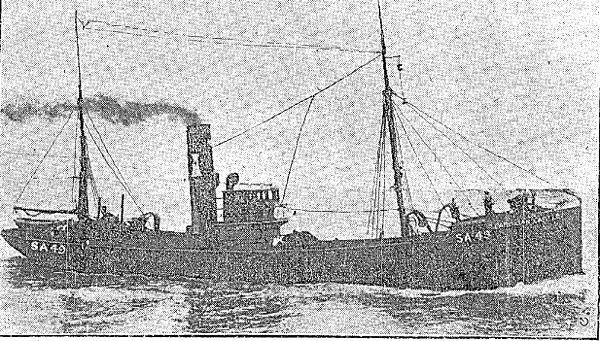 The Irish fisheries protection ship "Muirchu", formerly HMS Helga of 1916 fame, along with numerous trawlers, also helped in the search. Captain Meskill of the ferry S.S. Dun Angus was unable to take part in the search but his First Mate, Mike Folan provided great assistance. Fisheries protection boat Muirchú. Formerly HMS Helga. Shown here with arrested Belgian trawler. The fledgling Irish Air Corps brought four planes to the recently abandoned airfield in Oranmore where one was damaged when landing on a poor runway. Colonel Russell proceeded to Clifden by car where he found a suitable landing spot at Bunowen. This would be the first Aircraft assisted search in Irish history. Meanwhile, a De Haviland bomber, operating from Oranmore and piloted by an ex Royal Flying Corps and WW1 veteran, Captain Crossley , also joined the search. His observer was Lieutenant G Logan and they performed some daringly low passes as they checked out the many uninhabited islands off the West coast. They managed to drop supplies at High Island even though they found no sign of life. It was only when a boat from Clare Island managed to get to the mainland on February 18th that the full extent of the tragedy was realised. The twelve men of the Tenby Castle were given a heroes welcome in Clifden where bonfires were lit in celebration of their miraculous survival. Henry Batchelor's brother James, had been fishing about 300 miles to the West when he heard about the sinkings. He had rushed to the scene and had arrived at the morgue in Westport, where he feared his brother was, only to be told that Henry had been found safe and well on Clare Island. The bodies of the two fishermen from the Cardigan Castle were brought back to Swansea for burial on the 23rd February 1926. Draped in the Union Jack, they were carried ashore from the trawler Caerphilly, which had taken them home from Galway Dock. It was to be a heart breaking duty for the twelve men who acted as pall bearers. They were the twelve men of the Steam Trawler Tenby Castle, to whose rescue the Cardigan Castle had been racing, when she herself was wrecked. This then is some of the background to the launching, in September 1927, of a new Galway Bay lifeboat service under the command of Coxswain John Gill. This lifeboat station, renamed Aran Islands Lifeboat in 1995, was to carry out many great rescues and continues to this day. 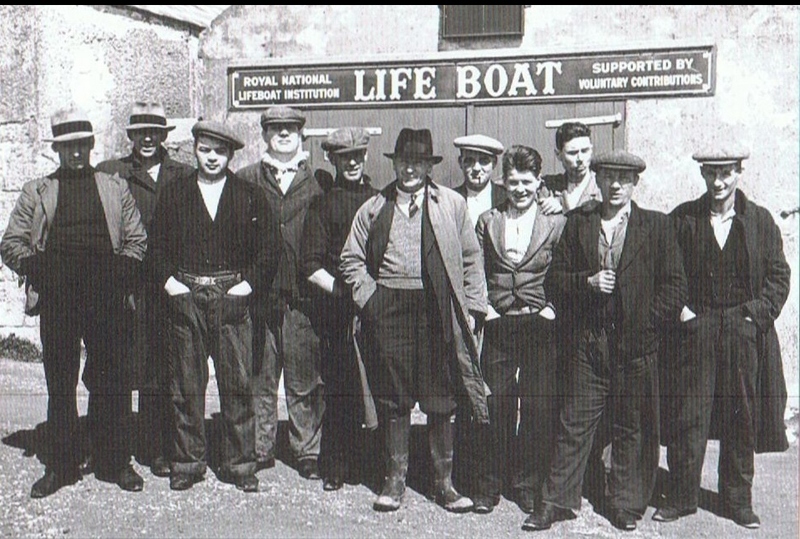 Lifeboat crew in London for award ceremony in 1939. Getting directions at Euston station from a friendly Bobby. The disaster of the sinking of the Cardigan and Tenby Castles was to be soon overtaken by what is known as "The Cleggan Bay Disaster". In late October 1927, less than two months after the inauguration of the Galway Bay Lifeboat, forty five men and boys from the West Galway and Mayo islands and coast were lost in a ferocious storm that blew up very suddenly. Most were fishing from currachs and had little chance when struck by near hurricane winds and gigantic seas. The area was never to be the same again and the loss of ten men on the Inishkea islands off Mayo would result in the islands being abandoned soon afterwards. The great Irish poet Richard Murphy, born that same year, was to write one of his best loved poems, "The Cleggan Disaster" in memory of this event. The new Lifeboat station in Kilronan operated from two sheds which lasted until 2011 when a fine new modern headquarters were opened. Day or night, always on call. Eighty nine years and still going strong. Leaving Cill Rónáin at full speed for a medical evacuation from Inis Meáin.